This article was the cover story of the Peninsula Daily News / Sequim Gazette special pull-out newspaper supplement, “Healthy Living”, dated March 2014. Something is growing in the heart of Quilcene… Some might only see a garden taking shape one a once-derelict plot of land located off U.S. 101 at Roberts Road. But others see community spirit unfolding in surprising ways. At times, the garden is humming with teams of volunteers digging a berm to create a large raised bed, removing huge rocks from the rich soil and moving wood chips or gravel to create pathways. Other times one may only see three dedicated women tending to vegetable beds, checking on a worm bin or planting seeds and bulbs. 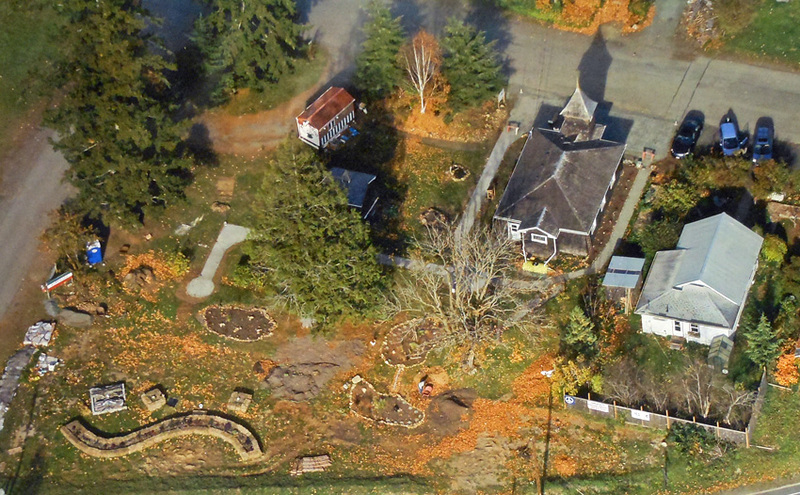 The name of this ever-changing project is Q (Quilcene) Gardens, and board members Anne Ricker and Juanita Thomas and Master Gardener Anita McCue have big plans for the demonstration garden. 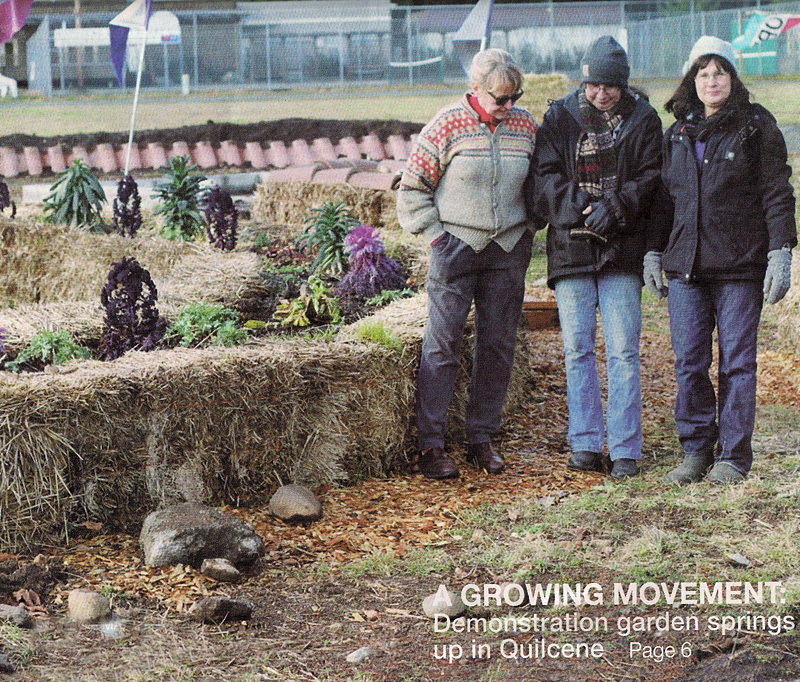 The garden project started in October 2012 when Quilcene artist and businesswoman Anne Ricker received a $14,500 grant through the Environmental Stewardship Council and Washington State University to educate Puget Sound residents on low-impact development (LID) to reduce stormwater runoff. Ricker began researching LID techniques by taking every workshop and seminar available on rain gardens, bioswales, low-impact gardening and green roofs. 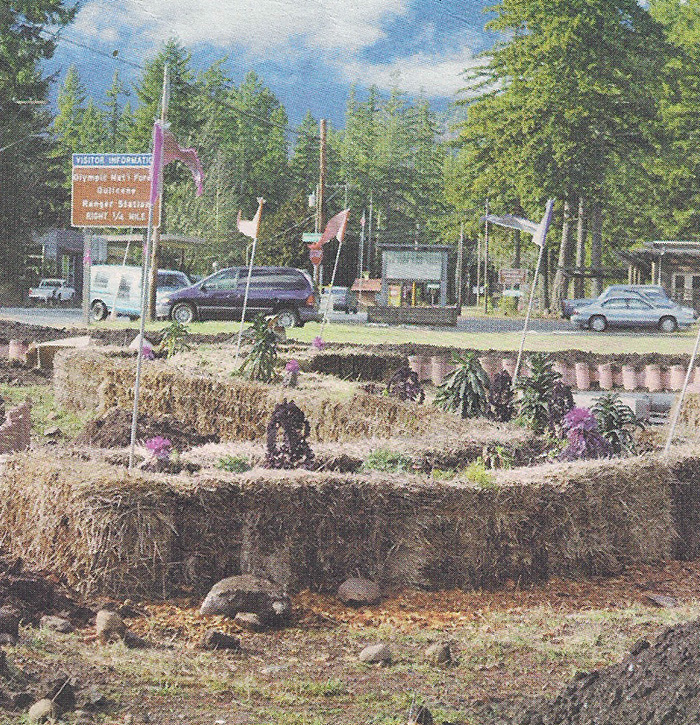 She selected the garden site for its visibility and proximity to the Quilcene Community Center and community activities. She worked with Quilcene resident John Helsper to design the garden. Different varieties of kale grow in raised bed made of hay bales in the vegetable growing demonstration area of the newly established Q Gardens.com The garden will feature a variety of raised beds to show Jefferson County residents different types of materials they can use to plant a garden at home. The gardens will use no water beyond that which is provided by rain. Tracy’s Insulation installed gutters to route water from a building roof to a 500-gallon tank that was donated by Ricker’s brother for irrigation. “If you have a roof and it’s raining the you are in business,” Ricker said. Plant materials were gathered by volunteers, from the Jefferson County Conservation District plant sale, McComb Gardens of Sequim and The Home Depot in Sequim. 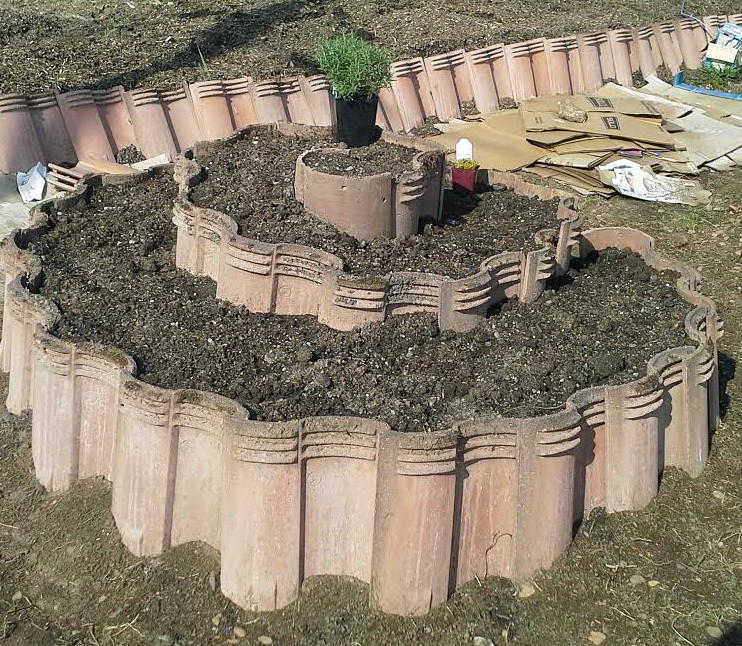 The initial installation of the garden was accomplished in June 2013 by 15 enthusiastic Washington Conservation Corps (WCC) crew members, Thomas said. “Volunteers have been amazing, if we need help, all we have to do is ask and they show up ready to work,” Thomas said. Tasks that volunteers have helped with include transporting, transplanting, chopping soil, and cleaning up rocks. “Community spirit is alive and well in Quilcene,” Ricker said. 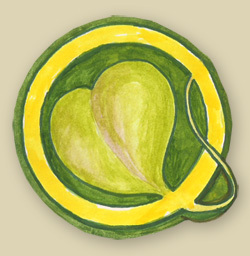 “So many people have made monetary and in-kind donations and pitched in whenever they find out we need something. It is an incredible thing to witness.” Thomas and McCue are used to working together. The twin sisters have always shared similar interests, including becoming Master Gardeners. “Anita grows food for our entire family, she is an amazing gardener,” Thomas said. The sisters offer free gardening classes at noon each Monday. Participants meet near Quilcene Espresso, 71 Old Church Road, adjacent to the Q Gardens. A herb spiral is an especially efficvient way to grow herbs. This is the beginning of a demonstration spiral raised planting bed at Q Gardens. McCue said the classes are a great way for people to meet other like-minded people and to find affordable resources such a s seeds, compost and plants in the area. “We welcome people of all experience levels,” Thomas added. “The demonstration gardens will highlight a variety of growing options. “We will have raised beds; in-ground plantings; a native plant area that includes grasses, berries and shrubs; flower demonstration areas; a fruit tree area; a worm bin; other compost options and more. A generous community member donated the 45 hay bales that outline the serpentine shape in the main raised beds and three smaller square ones. The beds are 4 feet wide by four feet deep, with the main bed measuring just under 64 feet long. “That raised bed will help produce fresh produce for the 300 to 325 clients that the Quilcene Food Bank serves and more,” Thomas said. Eventually Ricker would like to add a native rose garden, vertical walls planted with artwork, a hot glass-blowing studio and an attached greenhouse to capture heat, living fences, a windmill, a small water well and sculpture scattered throughout the garden. Ricker and other area artists will offer classes and demonstrations in the nearby Quaker church that is undergoing extensive renovations. “The sky is the limit when it comes to Q gardens,” Ricker said.